oGo works like a set of orienteering traffic lights. 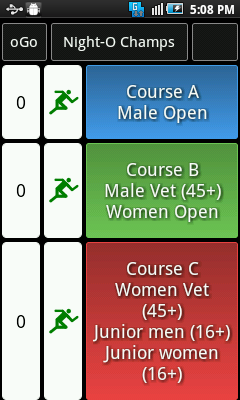 Green: A runner may start when their course is showing a green "runner". Red: As a runner starts the starter presses the course's start button and the "runner" figure changes to a red "standing" figure. The next competitor must wait as oGo counts down to the next start. Amber: Four seconds before the countdown ends the "standing" figure changes to an amber "get-ready" figure and a "beep-beep" alert starts. Green: When the countdown reaches zero the green "runner" returns and the next competitor may start immediately or any time after that. 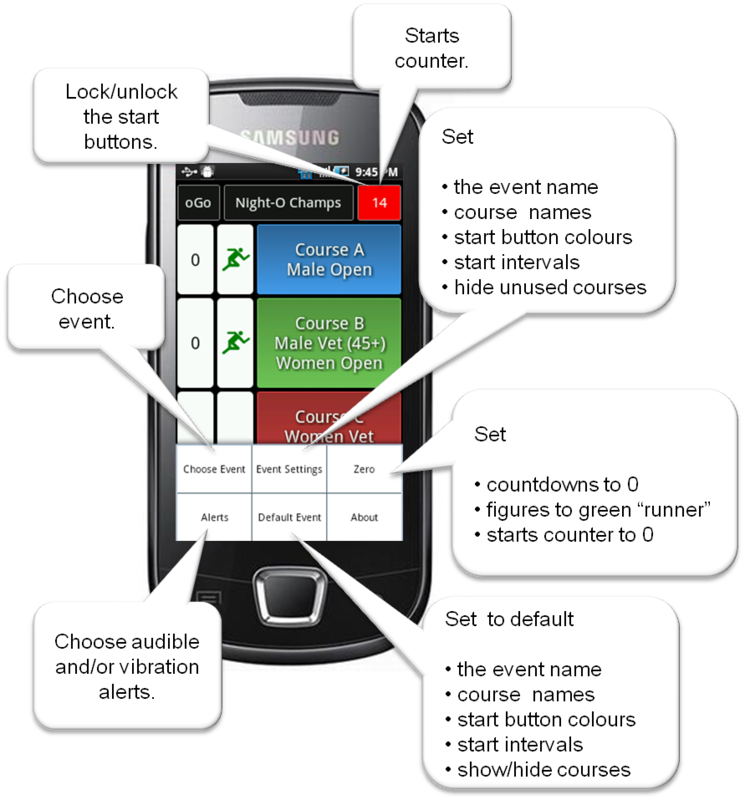 Each course may be configured with its own name, start interval and start button colour. 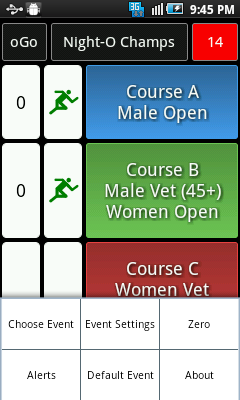 oGo can time starts for up to eight courses per event and store configurations for four events. oGo also keeps a count of the number of starts. oGo will run on Android phones and tablets (Android version 2.1 upwards) and on PCs or Macs with the BlueStacks App Player installed. (Some systems may not support BlueStacks e.g. some netbook PCs). Sound: Settings, Sound, Volume, Media Volume. Screen Timeout: Settings, Display, Screen Timeout. An event may be reconfigured while in progress e.g. to reduce start intervals if a queue has formed. 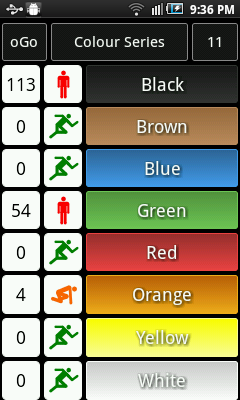 Configurable button colours are: black, brown, blue, light blue, green, light green, red, orange, yellow and white. Configurable start intervals are: 10s, 30s, 45s, 1 min, 1 min 30s, 2 mins, 3 mins, 4 mins, 5 mins and 10 mins. © Copyright Appin Design 2012-2013. All rights reserved.